Stephanie Bigelow is a Senior Consultant with Cushman & Wakefield’s Valuation & Advisory team, based in the Kitchener-Waterloo Region,Cambridge, Guelph, and Southwestern Ontario providing commercial property appraisal services. Stephanie uses her extensive knowledge of commercial real estate property appraisal techniques and resources to establish market studies working with Senior Valuation & Advisory professionals with Cushman & Wakefield’s real estate valuation services. Her valuation team focuses on a wide spectrum of commercial real estate appraisal asset classes including commercial, industrial, investment properties, development land, and many other unique properties. She is skilled in managing and executing a broad range of projects and assignments, and applies a wide degree of creativity and latitude to create client presentations and property appraisal reports. After graduating from the University of Waterloo, Stephanie began her career in commercial real estate as a Senior Research Analyst with Cushman & Wakefield Waterloo Region in 2012. 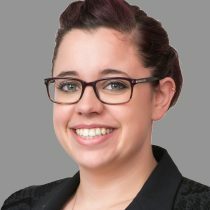 Throughout her time at Cushman & Wakefield Research, Stephanie worked closely with clients and coworkers managing and writing reports for large projects, creating and maintaining local market statistics, and coordinating with the National Research Group for database construction and national research reporting. Stephanie also worked on a wide variety of feasibility studies across all real estate sectors for both internal and external clients across Canada including financial institutions,developers and landlords. Stephanie received her Candidate Membership accreditation from the Appraisal Institute of Canada in 2016 and is currently a member in good standing.